Differentiated Word Work Plan . . . and so it begins. Ok, I’ve taken the last week or so to dive in and really get a grasp of what my kinders readiness levels look like in terms of literacy and I feel like I have a plan of action. Constant and ongoing assessment will be key, but I know that I can’t have my high fliers continue working on just their names and simple letter mastery when they are ready to move on to bigger and better things. I will still work with them on fluency and speed but I have to give them a little more challenge. Likewise, I need to really make sure the ones that are just getting their feet wet have the opportunity to find success and support that will not frustrate them. 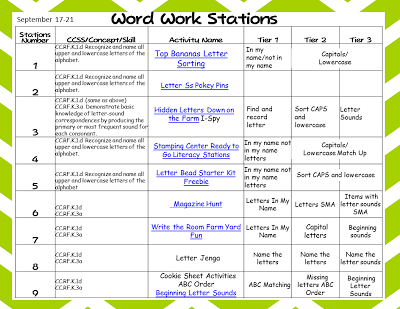 So I’m diving in and tiering my ‘word work’ stations for the week. These literacy stations will evolve into my ‘word work’ stations for Daily 5 so for the sake of keeping my kiddos from getting confused. 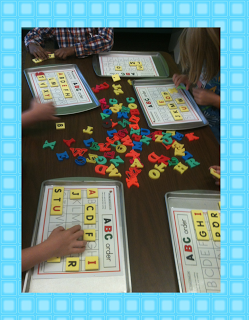 I just refer to them as Word Work Stations. Here is a gander at my over all plan. Yes I have math stations and learning centers as well. But since they are still in the exploring and getting to know routines stage, I’m only going to focus on Word Work Stations this week. If you click on the picture, it will take you to a google docs with the links to specific activities if you’re interested in finding out more. 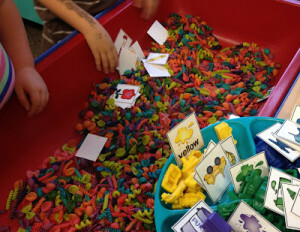 Station 1 is a sorting activity for letters that is part of my Top Bananas letter mastery systems. I like it because it’s very kinesthetic and my kinders love to move. The clothes pins are especially good for their fine motor development. Station 2: ﻿Pokey Pins. Another great fine motor activity that my kinders love. I have a bunch of these lined up in my wall so they can take the top layer off and see their creations after the fact. I’ll be using the number ones for math this year as well since I have so many with fine motor needs. Station 3: ﻿I always have the option for students to work on some kind of an I-Spy activity. It’s great visual discrimination exercise and the logical thinkers in my class love the whole ‘puzzle’ dimension of it. They try to see how fast they can find the answers and even when they complete it, they want to do it again. This one is differentiated for early literacy learners. 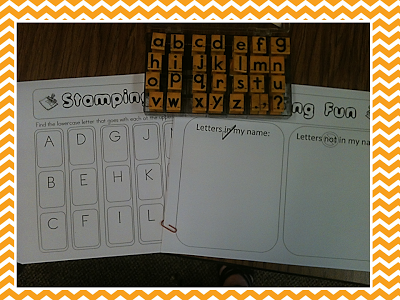 Station 4: Stamping Stations are always a favorite and it gives kinders another way to represent what they know without having to actually write the letter. For those that still struggle with writing and fine motor mastery, they can show me what they know and not have to worry (this time) about writing it. Plus, who doesn’t love stamps? 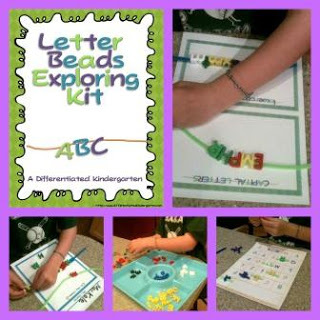 Station 5: ﻿Letter Beads. I love that my letter beads now have a purpose. This will be a stable station in word work stations because my kinders love it, it’s great fine motor exercise, and I will have activities for the year to keep them busy and challenged. 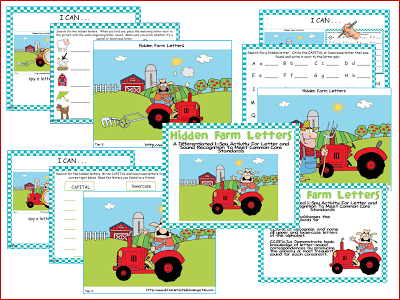 This starter series is free and it will give them a good start on how to use the materials and offers letter recognition activities. Station 7: Write the Room Farm Yard Fun. There’s several different ways to tier this activity. I love write the room activities and I use them for math and literacy so this is always a choice for my students. Again, this is one that if they finish, they always want to go back and do it again. It’s amazing. The logical and kinesthetic learners especially love the movement component to this activity and the challenge of finding out where all the cards are placed. Be brave and give write the room a try. Kindergarten should be active, there should be movement and it’s ok . . . especially when they are engaged as they will be with write the room. ﻿Station 8: Letter Jenga- I can’t believe in all my pictures of all the activities my class does, I do not have a picture of this but I don’t! I will get you one when I do my recap. I think everyone has done this activity in their class. I came across some little mini Jenga sets a few years back and was able to make an entire 11 sets for each of the 11 Dolch word lists so the letter one is really helpful in teaching my kiddos about the game and how it works. Definitely a class favorite. Station 9: Cookie Sheet Activities- Julie Van Alst from Make Take Teach is one of the smartest people I know and just happens to be an RTI consultant for my school district. 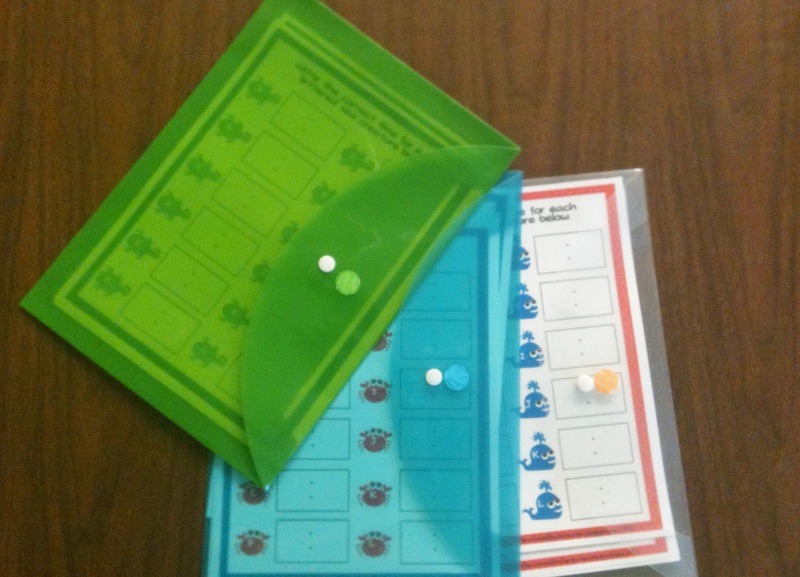 She makes great products and her cookie sheet activities are perfect for my class because they are mobile, tierable (is that a word) and the kids love them. This week I continue to use her ABC order set and will introduce her Beginning Sounds set to my students who are ready for that challenge. 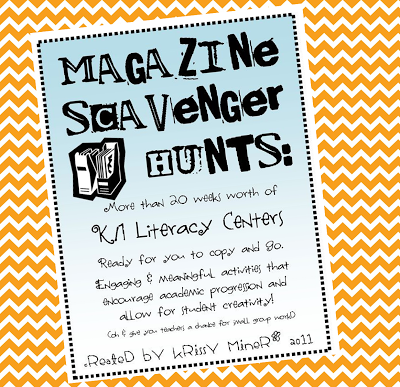 You’ll be seeing these activities in many of my stations throughout the year. and inside there are color coded (there are little colored dot stickers on them) poly envelopes. I have laminated colored name cards, whichever color your name is written on is the color of poly envelope you use. Because the name cards are laminated, I can change them as anytime which is GREAT for ongoing assessment and flexible grouping needs. 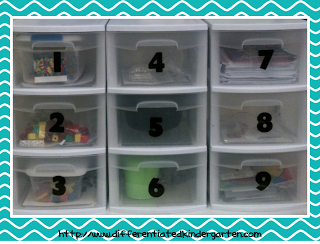 If you want more details on how I organize this you can see it in an older post HERE. So that’s it. I’ll be back later in the week to recap how they went and give you some updates on how my Daily 5 journey is going. Daily 5 Update and a Few Successes. 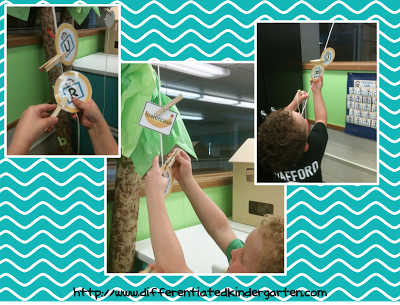 Daily 5: 2nd Edition-Daily 3 Math – My Differentiated Kinder Spin on it! 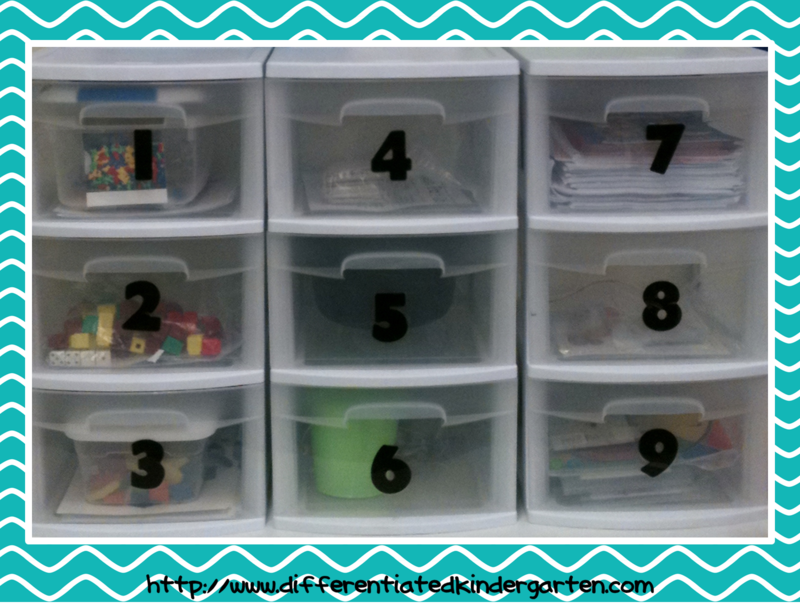 What is your organization method so the kids know which activity they are expected to do? I added some details for you to this blog and it references another post that I did. Hope that helps. If not give me holler back and I’ll answer any specific questions that I can. Could you share your general daily schedule? I also have math stations and learning centers daily. 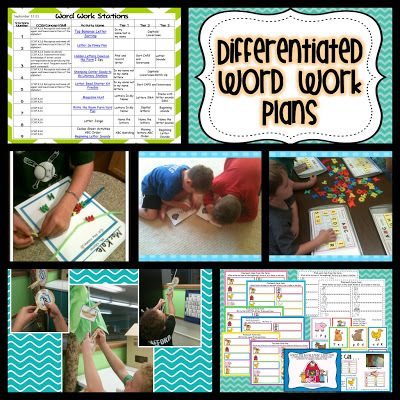 I wanted to work in word work or phonics stations in this way but can’t quite figure out how to make it work in my schedule. I teach full day Kindergarten. Thanks! I think I can do that except my schedule is a mess. I’m on day nine of the school year and there are still some changes. You’ll also see when I post it that I do not have the luxury of having the same activities at the same time each day. My schedule is ALL over the place. But we make it work. I’ll see if I can get something posted soon. These activities look wonderful and great for both struggling and advancing students. I have a quick question, how do you introduce these activities? Like do you introduce them on different days? Do you do a whole group practice? Just very curious how you work it all out. I always have a difficult ensuring that my students actually KNOW what to do at my particular centers/activities. My email is hellonr14@aol.com.  Thank you so much for all your sharing!! Norma, most of the activities I introduce in these first couple weeks of school and then stations like I-spy or write the room become second nature to them. There are always new activities however and depending on the type of activity I may introduce them in small group or it might be something I introduce to the whole group. It just depends on the activity. I like to introduct math activities quite often during my Calendar Book time and do it a couple times over several days before students use them in stations. There really is not wrong or right way. I will say however, if you are introducing new manipulatives you will want to give them the opportunity to explore and ‘play’ with them for a bit before expecting them to work with them. Hope this helps. I would love to hear about the management aspect of introducing venters as well. Especially at the start of the school year. I love all your centers but get overwhelmed when I process through teaching the procedures to the kids! I always think it’s easiest to teach management, expectations, transitions and routines if the activities are more exploratory these first couple of weeks. The centers themselves prior to this week have been very basic and there hasn’t been alot of heavy thinking involved necessarily but it has allowed them the opportunity to learn how to manage materials and transitions. I have to say, despite the large number of students I have in my small space this year, they transition and manage materials well because I have given them time to practice, practice practice it. I’m not sure if this helps but drop me a note if you have other questions. I’m interested in the answers to the previous readers as well. I would also like to know how your Tiers are rated. Is tier 3 your top group or you lowest group. We use the term tiers as well, but Tier 3 is our most at risk group in our rating system. Thanks for being so willing to share your ideas. Carol, thanks for your question. I’m not sure if there is a right or wrong way to number your tiers but this is what works for me. My students never see the tiers. 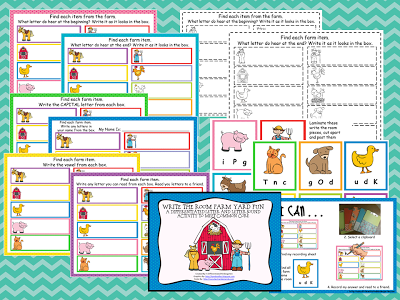 I basically use colors and animals for them and since I use flexible grouping, there could be kids with three different colors in a group. All they know is that they are blue or green or orange and so that’s the color envelope they take their materials from. I have always worked 1 lowest, 2 medium and three highest. But it’s just my personal preference.